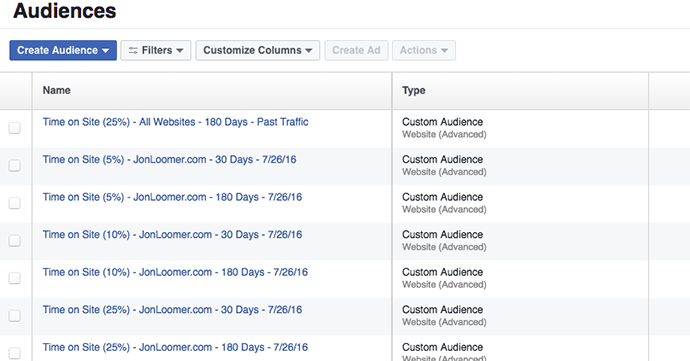 Back in May, Facebook made updates to Website Custom Audiences that gave advertisers more targeting power based on quality of website visit. That launch allowed advertisers to create audiences based on frequency of actions taken. 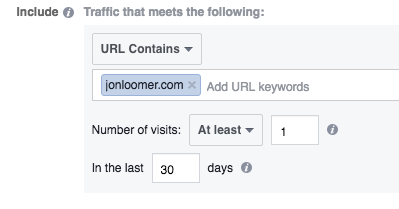 In the example above, an audience is being generated of people who have visited JonLoomer.com at least 20 times during the past 30 days. But this update also included the ability to create audiences based on frequency of events occurring, like registrations, purchases and searches. 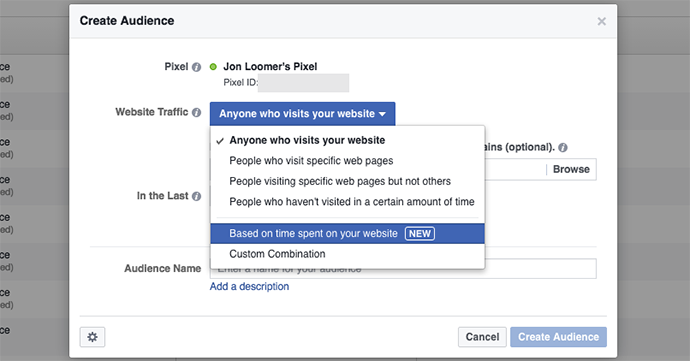 The big news: You no longer need a third party tool to create audiences based on time spent on your website. 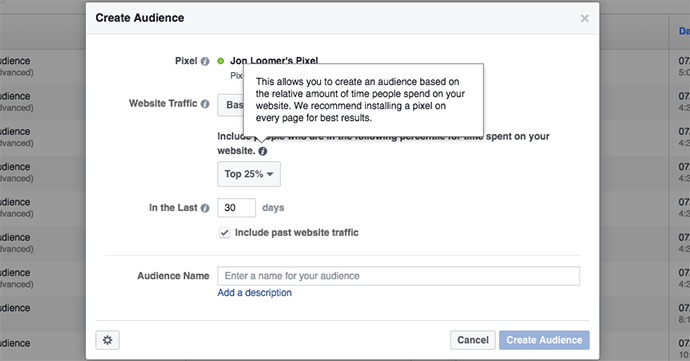 To create a Custom Audience based on time spent on your website, start by creating a Custom Audience within Ads Manager the way you normally would. This allows you to create an audience based on the relative amount of time people spend on your website. We recommend installing a pixel on every page for best results. You’ll recall that when creating an audience based on frequency of website visits or events, you entered the number of times someone visited. Not this time. Your website gets 100,000 visitors during the past 30 days. 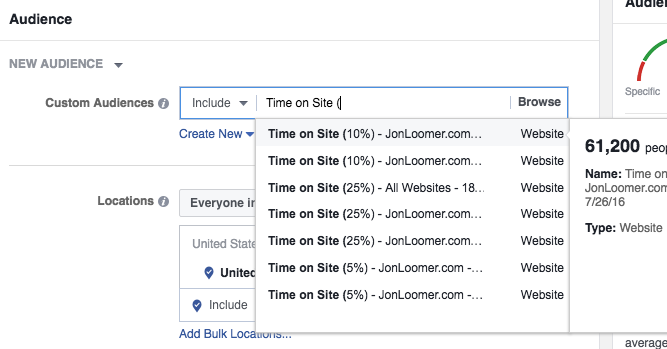 Those visitors are listed (hypothetically) in order of time spent on your website. 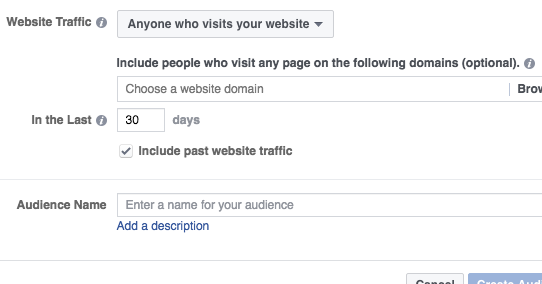 So the first person has spent the most time on your website during those 30 days. We’ll say they spent 10 hours. The last person spent the least amount of time. We’ll say they spent one second. 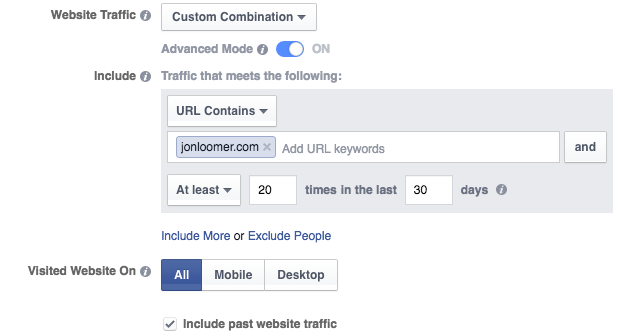 To create an audience of the top 25% of active users on your website, Facebook takes the top 25,000 in this case. 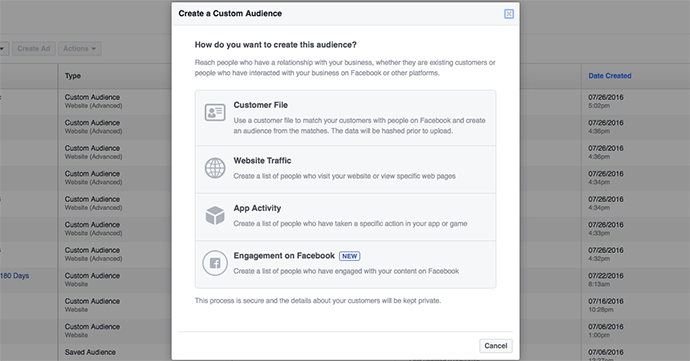 When creating these audiences, they will appear on the Audiences page along with other Custom Audiences, Lookalike Audiences and Saved Audiences. You can then target or exclude this audience when editing the audience while creating an ad set within either the Ad Create Tool or Power Editor. This option is awesome! Prior to the May announcement, you could create an audience of your website visitors, but it was difficult isolating the best ones. Some people may have visited once for three seconds while some others visited 30 times for 10 hours. They aren’t equal! Then came along the frequency option, and you could focus only on those who visited a minimum number of times. Very helpful. The ability to isolate time on site takes it a step further. Sure, maybe you visited three times. But were those three quality visits? Would you rather target someone who visited three times for 10 seconds or once for one hour? This development will allow advertisers to target their most engaged website visitors. I hadn’t created 20 audiences for time on my website, but the others I created for frequency of visits contributed to the limit of 20. If you hit that limit, you can always delete the audiences you aren’t using. I fully expect this to be a temporary restriction that Facebook will eventually remove when the rollout is complete and the feature is proven to be stable. Go back and look at the screen grabs above of the process to create these audiences. You’ll notice that there is no way to filter by URL or domain. This is a problem for any advertiser who has their pixel on multiple websites. While I wouldn’t advise having one pixel on different websites you don’t own (like for clients), I’ve personally had my pixel on two unrelated websites I do own. 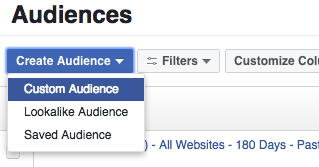 Not having a domain filter would make this feature worthless for me because it would create an audience of the most active visitors from both sites combined. Because of the second issue above, I decided to create a separate ad account for my other website and replace the pixel with one that is unique to that website. 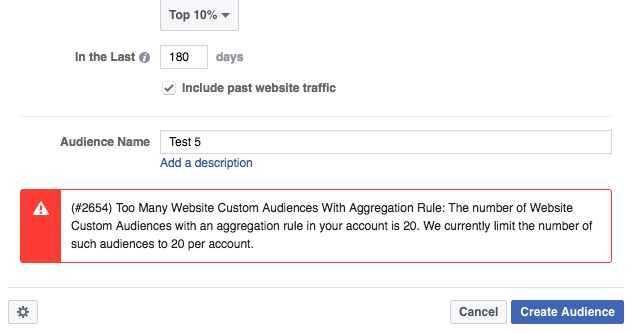 Of course, since I just did that on July 26, I’d want to be sure to uncheck the “Include past traffic” checkbox when creating the audience since I would not want to include the traffic that hit that pixel prior to removing it from my other website. As you can see above, the audience that included past traffic for the past 180 days is the same size as the audience that was created on July 26 and wasn’t supposed to include past traffic. I again alerted Facebook of this issue. 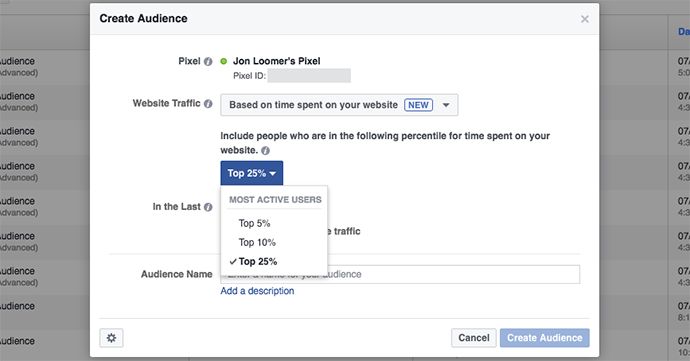 If you’ve created Website Custom Audiences before, you know that the audiences tend to build very quickly — within minutes — assuming you’ve had the pixel on your website for a while. Well, that’s not the case when creating these audiences. I found it took several hours to build. My assumption is that it’s again because this is a new feature. It’s likely that instead of running every few seconds, there is currently a process that only runs a few times per day. I expect this to eventually change and mirror the real-time building of other Website Custom Audiences. I don’t know. But like all rollouts, these things tend to take weeks if not months. What do you think of this update? Do you have it yet? How will you use it?